Quico says: I never thought I’d see the day. 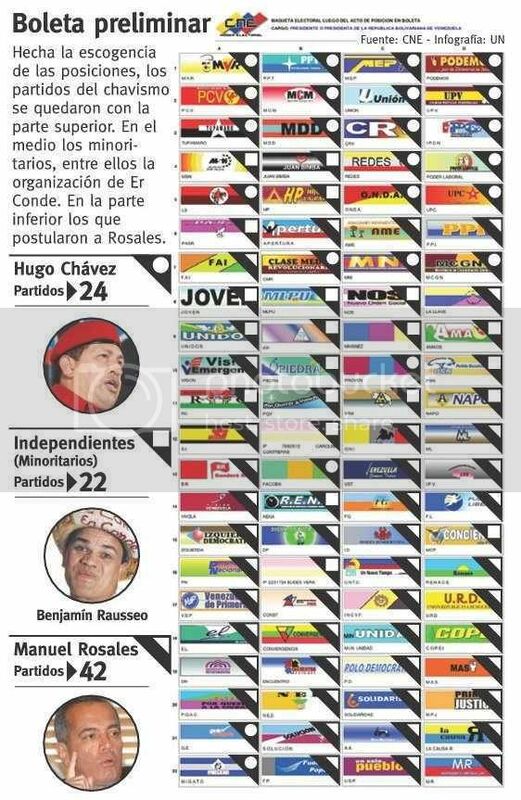 The three most significant pro-government parties other than Chávez’s own (Podemos, PPT and the Commies – which together got 14.6% of the vote in Dec. 2006) have balked at Chávez’s calls to merge into the emerging United Socialist Party of Venezuela. It’s definitely a man bites dog moment. Will wonders never cease? Me? I find it frankly baffling. After years of rolling over and playing dead at every presidential demand, Podemos’s Ismael García suddenly discovers the horrors of Single Think. Mind you, this is a party that has never once had a significant policy difference with Chávez. I mean, you couldn’t beat a programatic difference between MVR and Podemos out of Ismael García if you tried . The call to “make an honest woman” out of his party by folding it into a single Leninist juggernaut is the only chavista thought the guy’s ever dissented from. Same goes for PPT and PCV, parties that long ago realized that even the mildest of political contrasts with the Chávez party line risked tainting them as fifth columns, parties that have gone to extraordinary lengths to homogenize their views with the official line, parties that long ago ceased to have any independent political identity apart from their allegiance to Chávez. Suddenly, when their residual control over patronage opportunities (by selecting candidate slates and such) is challenged, they become committed pluralists. Please! Turns out there is one thing that chavistas love more than they love Chávez: seeing the words “Secretario General” on their business cards. The development seems even more extraordinary because the consequences seem sure to be dire: Chávez broaches no dissent, and is more than likely to kick them out of the government and purge their supporters from decision-making posts. That’s how much these guys love their parties.